Easy, cheap and good cookies recipe?!? Yes, it's possible and that's exactly what this post is all about! I have been back in the US since last Tuesday and I really really really wanted to do something yummy to restore my Happy Monday (HM) tradition. However, I'm also not back in full baking mode yet and over the weekend I had to make the June Daring Bakers' Challenge, which already took a lot of time. I wanted something good and quick for my Monday morning. A simple treat! I chose this recipe because of all the cookies recipes I've tried in the last couple of years, this is probably my favorite! 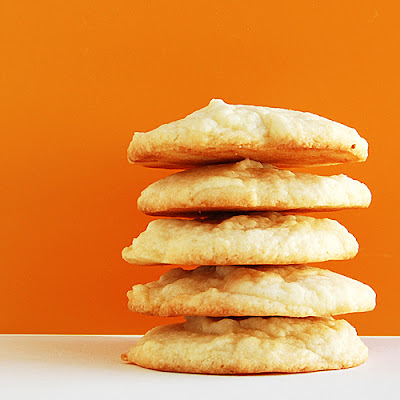 These cookies are super yummy, with some kind of cheesecake taste that I love and that make them very different from the typical chocolate chips cookies. They are light and chewy. Also, as I said, the recipe is very simple, both in the ingredients and in the method. You can pull out these cookies in 15 minutes, so they are perfect for a sudden craving or a last minute treat or an unexpected visit. No weird or less common ingredient is required, so if you have a craving you don't have to rush to the store to buy some improbable ingredient. Finally, a batch makes more or less 30 cookies, which should be enough to satisfy any cookie craving....except in my home....they never last more than a few hours. I have used this recipe now for a few years. I honestly do not know where it came from in the first place....a friend of mine in school (a big expert in cookies...I've never know anybody having as many cookies recipes as she had!) gave it to me. Recently, I have seen a similar recipe on Baking Bites, a blog that I really love....you should check it out...I'm positive the result is amazing too! Preheat oven to 325F and prepare a baking pan with parchment paper. In a large bowl, beat together the butter and the cream cheese. Slowly, mix in sugar at medium speed until light and fluffy. Finally, beat in the egg, the vanilla extract and the salt. In a small bowl, mix together the baking powder and the flour and slowly add them to the cream cheese mixture. Spoon the batter onto the baking pan. Bake at 325F for 12-14 minutes, or until the bottom edge just barely turns brown. Baking Tip: Make sure you do not over bake them. When the bottom edge starts to turn brown they still seem not cooked at all on top but they actually are! After 10 minutes I usually move them on a higher rack in the oven. Thank you so much for this recipe! It was absolutely delicious. The tips were very helpful as well. Can you add any fruit into the mix? Like, raspberries? How would you add the fruit? I want to make this, but want to add either raspberries or strawberries.. please do tell.